TIA received this slide-show from one of our readers that presents the traditional procession of the Virgen del Rocio which takes place yearly at Pentecost in Andalusia (southern Spain). The scenes shown in the slides probably took place in 2008, but no date was specified. 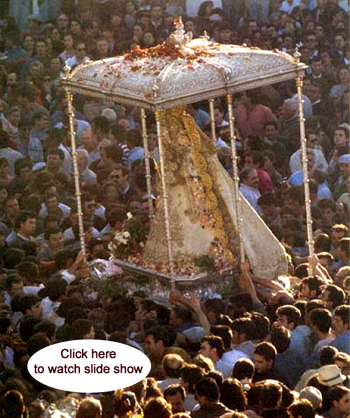 Even though we lament some scenes of women who could be better dressed in a procession to honor Our Lady, we believe this slide show is interesting for Americans to observe the great participation of the people in a Catholic procession, something we rarely see in the United States. It reflects the devotion and deep Catholic sense of the Spanish people, even in these post-conciliar times. We believe this slide-show captures some of the joy, vibrancy and love of the Blessed Virgin that typify the best of the Catholic Spain of old. The week before Pentecost, the hamlet of Rocio in the Andalusian countryside honors Our Lady in one of Spain's biggest feasts - the Romeria Del Rocio, the pilgrimage to El Rocio. Nearly one million people travel to the marshes near the mouth of the Guadalquivir River to pay homage to the Virgen del Rocio in a week long celebration of praying, singing, eating and dancing. 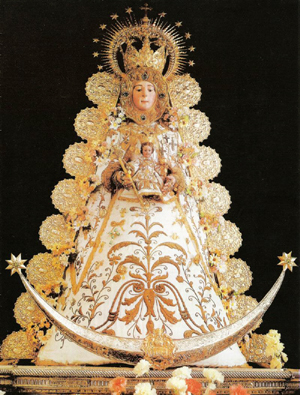 This tradition dates back to the 15th century, when the statue of the Virgin Mary was discovered in a tree trunk near the marshes of the hamlet of Rocio, close to the village of Almonte. Over the centuries the Pentecost procession and feast to honor the Virgin became more and more widespread. Today, hundreds of ‘brotherhoods’ from surrounding villages and towns organize the processions that end in Almonte on the weekend of Pentecost (this year May 30-31). Travelers come from all over Andalusia on foot, on horseback or in the traditional wagons. No motorized vehicles are allowed. Most of these pilgrims wear the traditional Andalusian clothing, the women in bright flamenco dresses and the men in their wide-brimmed hats and short-cropped jackets called ‘boleros’. Around their necks are the traditional pilgrim silver medals on a green ribbon. The pilgrims arrive in the village of Almonte just before dawn on Pentecost Sunday for the grand procession through the plains and marshes that ends in an outdoor Mass where the rich banners of all the brotherhoods are displayed. Then the procession starts again and continues into the late night. Accompanied by tambourines, flutes and guitars, the people joyfully sing and vie to draw near and touch the large silver shrine that contains a rich effigy of the statue of the Virgin dressed in gold vestments adorned with precious stones. The sound of firecrackers fills the air as the crowds cry "Viva la Reina de la Marisma" ("Long live the Queen of the Marshes") and “Salve Rociera” with its rousing Olé! Olé! Here are the lyrics you will hear in the background of the slide-show, with an English translation of the verses. To sing to the Virgin with faith and with an olé.